Gustavus Adolphus College’s 2019 Ronald S. and Kathryn K. Christenson Lectureship in Politics and Law will be held from 7-8:30 p.m. on April 16 in Wallenberg Auditorium in the Nobel Hall of Science. This year’s lecture will feature Justice Barry Anderson, senior member of the Minnesota Supreme Court, giving a lecture titled Preserving the Rule of Law. Anderson graduated from Gustavus in 1976 with majors in political science and history. After Gustavus, he went on to the University of Minnesota Law School and practiced in Fairmont and Hutchinson, serving as Hutchinson’s city attorney before being named to the Minnesota Court of Appeals in 1998. He was appointed to the Minnesota Supreme Court in 2004, and has written over 800 opinions in over 20 years of in statewide office. “The Gustavus Department of Political Science was founded in 1969 by Ronald Christenson. For the 2019 Christenson Lecture, which is also the 50th anniversary year of our department, it seemed only fitting that we invite one of the most distinguished alumni, who was also among the finest students of our founding member,” political science professor Richard Leitch said. The lecture is funded through a gift by Kathryn Christenson in honor of her husband, Ronald, who was a longtime political science professor at Gustavus. Justice Anderson’s lecture will touch on the importance of law in our society, a topic relevant to all citizens and an area current political science students frequently hear about in their classes. The lecture also helps further messages that political science teachers want to emphasize in their classes by providing real-world legal examples. “All political science courses consider the rule of law in some way,” Leitch said, pointing out that Dr. Lori Carsen Kelly, a former student of Christenson’s, is teaching “Law and Society” in the department this semester. Dr. Jeff La Frenierre with his drone equipment in the Nobel Hall of Science. Gustavus Adolphus College geography professor Jeff La Frenierre’s revolutionary glacier research is featured in a new BBC program called Earth From Space. The science and nature show uses “cameras in space [to] tell the story of life on Earth from a brand new perspective,” and includes the Gustavus professor’s work tracking and documenting glacial melt — and the downstream effects on water availability — on Ecuador’s Mount Chimborazo. Earth From Space will premiere on April 17 at 9 p.m. on BBC 1 in the United Kingdom. The episode featuring La Frenierre and his research team will air on BBC 1 on May 8 and run in the United States as part of PBS’ Life From Above later in 2019. “It’s been exciting to have the opportunity to work with the BBC in the field,” said La Frenierre, who regularly includes Gustavus students in his research. Recent graduates Casey Decker ’18 and Abby Michels ’18 make appearances in a recent BBC web exclusive alongside La Frenierre. Campus Opening at 10 a.m.
SUBJECT: Campus Opening at 10 a.m.
Gustavus campus activities will begin at 10 a.m. this morning due to the winter storm. Employees are expected to report to work by 10 a.m. or contact their supervisor. Unless your role requires you to be on campus earlier, employees are asked to wait until at least 9:30 a.m. to come to campus so that Physical Plant staff can work to clear streets and parking lots. 8 and 9 a.m. classes are canceled. The Daily Sabbath service will take place as usual. The cafeteria will open at 7 a.m. (Students employed by Dining Service are expected to report to work as scheduled or contact a supervisor.) Lund Center and the Folke Bernadotte Memorial Library will open at 10 a.m.
College officials are continuing to monitor weather conditions. Please continue to watch your email and text messages in case conditions change dramatically. Please stay aware of weather conditions and allow extra time for travel. Dr. Valerie Banschbach and Dr. Elizabeth Kubek will join the Gustavus Adolphus College community as associate provosts and academic deans beginning this summer, Provost and Dean of the College Dr. Brenda Kelly announced today. Selected from a strong pool of candidates following a national search, Banschbach and Kubek will provide administrative leadership and support for the College’s 25 academic departments and 12 interdisciplinary programs while working closely with department chairs and the faculty to advance the Gustavus mission and execute the Gustavus Acts Strategic Plan. Their work guiding the College’s rigorous and supportive academic environment will include budgetary and hiring responsibilities across all academic programs, oversight of the general education programs, and assessment of institutional student learning outcomes. Dr. Valerie Banschbach comes to Gustavus from Roanoke College, where she currently serves as professor and chair of the environmental studies program. A celebrated teacher who has developed new course offerings both on-campus and abroad, she is the President-elect of the Association for Environmental Studies and Science and the 2019 recipient of the Outstanding Faculty Award from the State Council of Higher Education of Virginia. Before joining the faculty at Roanoke, Banschbach was the chair of the biology department and founding director of environmental studies at Saint Michael’s College in Vermont. She holds a bachelor of arts in biology from Pomona College and a doctorate in biology from the University of Miami. Dr. Elizabeth Kubek joins the Gustavus community after serving as professor of English language and literature and founding program director of the medical humanities major at Benedictine University in Lisle, Illinois. Her diverse experience includes serving as assistant provost for new student learning initiatives, chair of languages and literature, and director of the gender studies major. Recognized as an interdisciplinary teacher and scholar whose work is shaped by literary theory, gender studies, faith, culture, social justice, and medicine, Kubek received her bachelor of arts degree from Clark University and holds masters’ and doctoral degrees in literature from the University of Rochester in New York. Dr. Alisa Rosenthal has been named the provost at Randolph-Macon College in Ashland, Virginia. Gustavus Adolphus College Associate Provost and Dean of Sciences and Education Dr. Alisa Rosenthal has been named the provost at Randolph-Macon College in Ashland, Virginia, and will begin her duties as the college’s chief academic officer on July 15. In her 15 years as a professor in the Department of Political Science at Gustavus, Rosenthal also took on a series of faculty leadership and administrative positions that advanced the mission and vision of the College. Most recently, she has served as Associate Provost and Dean of Sciences and Education and Special Assistant to the President for Diversity, Equity, and Inclusion. A member of the Gustavus faculty since 2004, Rosenthal won the Swenson-Bunn Memorial Award for Teaching Excellence in 2006 and the Edgar M. Carlson Award for Distinguished Teaching in 2012. Rosenthal’s other leadership roles include serving as the director of the John S. Kendall Center for Engaged Learning, co-chair of the action team that developed the College’s Gustavus Acts Strategic Plan, founding director of the Gustavus Fellowships Office, and vice-chair of the faculty senate. An expert in constitutional law and political theory, she spent the 2016-2017 academic year on the president’s cabinet at Wabash College as the recipient of an American Council on Education fellowship. Rosenthal holds a bachelor’s degree in history and political science from Beloit College and a master’s and doctorate in political science from the University of Wisconsin-Madison. 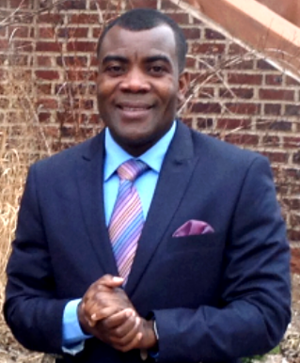 Pastor Sosthene Muzenende Kubisa will visit Gustavus Adolphus College to give a lecture titled “When Peace Conquers War: Experience of the Democratic Republic of the Congo” at 7 p.m. on Tuesday, April 9 in Confer Hall 127. The founder of an African non-governmental organization called Laissez l’Afique Vivre (Let Africa Life), Kubisa has worked closely with 2018 Nobel Peace Prize winner Dr. Denis Mukwege to help those affected by civil unrest and violence in the DRC. Kubisa’s lecture will focus on the continuing efforts for peace in the Democratic Republic of the Congo and include stories of his work. The lecture is sponsored by the Gustavus African Studies Program and will also make a personal between Kubisa’s peacemaking work and his personal life – his daughters, Ingrid and Reidun, are current Gustavus students. Tuesday’s lecture is free and open to the public. Gustavus Adolphus College senior honors psychological science major Kristen Eggler was recently named the 2019 winner of the Donald G. Paterson Award in Psychology by the Minnesota Psychological Association (MPA). The Paterson Award recognizes and encourages high achievement in psychology at the undergraduate level and is given to an outstanding college senior planning a career in psychology. Each college in Minnesota nominates one senior student for the award every year and the award is given based on evidence of superior achievement in psychology and other areas of study, potential for further work in the field of psychology, and personal characteristics and attributes. “It’s an honor to be identified as someone who can make a difference in the field of psychology in the future,” said Eggler. Her psychological science honors research project focuses on how motivational factors improve creativity and performance. By studying how factors such as autonomy and positive affect impact productivity and creative output, businesses and other organizations can learn to improve the employee experience and maximize employee efficiency. Eggler, who is also pursuing a management minor, is currently applying to graduate schools to study industrial and organizational psychology. Outside of the classroom, she is deeply involved in the Gustavus community. A member of the Chapel Choir and Sigma Sigma Sigma sorority, she has also served as a Collegiate Fellow resident hall adviser and Nobel Conference host. After graduate school, she plans to pursue a career in research and consulting, with the goal of helping organizations build healthy work cultures. Coach Whitey Skoog with the Gustavus men's golf team at the 1990 NCAA Championships. Longtime Gustavus Adolphus College coach and physical education professor Myer “Whitey” Skoog died this morning at the age of 92. 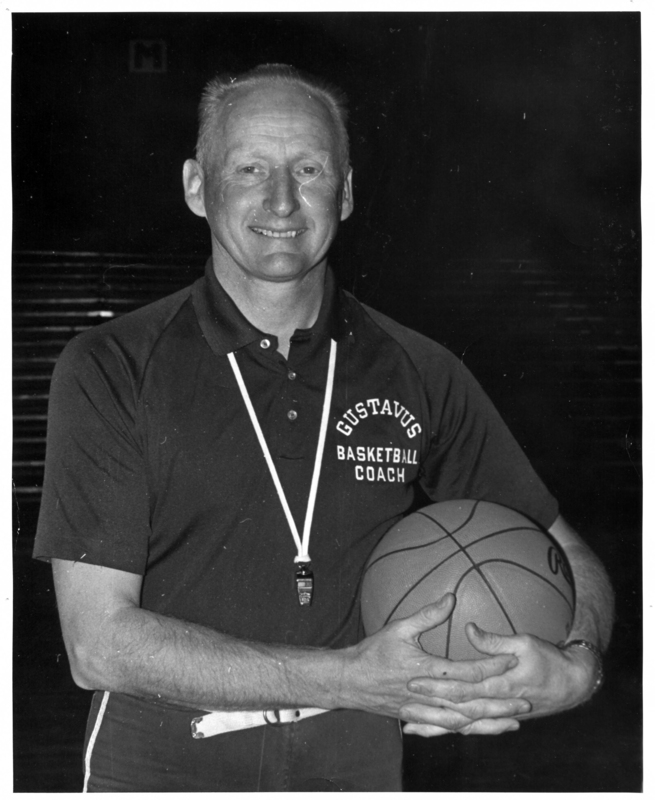 Skoog, who joined the Gustavus athletics staff in 1957 after a back injury cut short his professional basketball career, served as the head coach of the men’s basketball and men’s golf teams in addition to his teaching duties in the health and exercise science department. He retired in 1996 and continued to live in Saint Peter. Skoog became the Gustavus men’s basketball coach in 1957. Prior to coming to Gustavus, the Brainerd, Minn., native was a guard for the University of Minnesota basketball team between 1947 and 1951. He earned All-Big Ten and All-America honors during his senior year and was widely known as one of the foremost developers and practitioners of the jump shot, a technique that revolutionized basketball. He took his patented shot to the Minneapolis Lakers of the National Basketball Association in 1951, where he became one of the premier guards in the league and played on teams that won back-to-back-to-back NBA Championships in 1952, 1953, and 1954. As the Gustavus basketball coach from 1957-1981, Skoog’s teams won two MIAC Championships (1968, 1975) and made seven national tournament appearances. But despite his professional background on the hardwood, it was on the links where his coaching prowess truly shined. With Skoog at the helm of the men’s golf team from 1973-1996, Gustavus teams won 17 MIAC Championships including an unprecedented 13-straight conference titles from 1982-1994. His teams finished in the Top 5 at the NCAA Championships seven times. On the golf course, he coached 16 individual conference champions, a national champion and Ben Hogan award winner in Jon Lindquist, 11 PING All-Americans who received All-America honors a total of 21 times, three CoSIDA Academic All-Americans, and 12 Cleveland Golf/Srixon All-American Scholars. 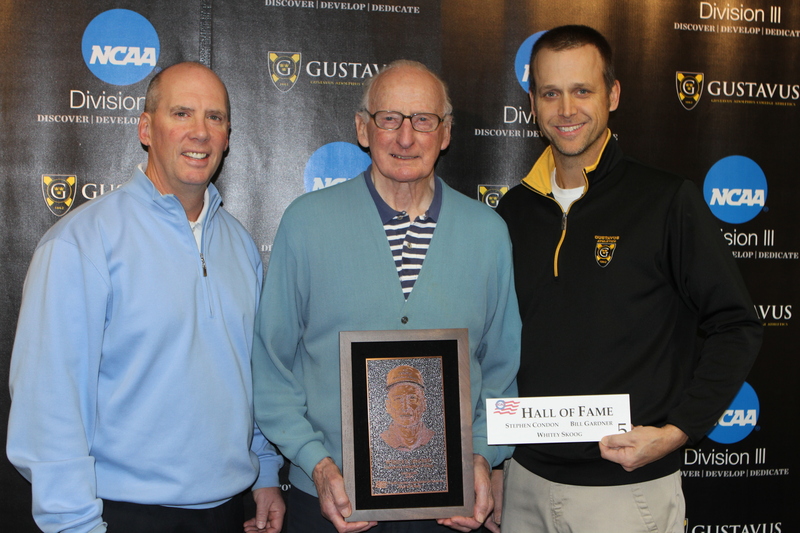 A nine-time MIAC Coach of the Year and seven-time District 5 Coach of the Year, Skoog was selected as the national coach of the year following the 1990-91 season, was inducted into the Gustavus Athletics Hall of Fame in 1987, and was inducted into the Golf Coaches Association of America (GCAA) Hall of Fame in 2014. Skoog, pictured here with Director of Athletic Development Randall Stuckey and current men’s and women’s golf coach Scott Moe, was inducted into the GCAA Hall of Fame in 2014. A visitation is planned for Monday, April 8, from 4-8 p.m. at the Saint Peter Funeral Home. The funeral will take place on Tuesday, April 9, at 11 a.m. at Union Presbyterian Church in Saint Peter. Bjorn Kjelstad in Medellin, Colombia. Less than 12 hours after walking across the commencement stage at Gustavus Adolphus College, Bjorn Kjelstad ’17 was on an airplane, heading toward his new job as a Program Assistant for the Council on International Education Exchange (CIEE) in Guanajuato, Mexico. After serving in the role that summer, he returned to the United States as an intern for the Council of Hemispheric Affairs in Washington D.C. Following his stint in Washington, Kjelstad joined the research and writing team at InSight Crime in Medellín, Colombia. InSight Crime is a foundation that focuses on studying organized crime in Latin America. Some of the topics he’s researched include fentanyl trafficking, illegal wildlife and timber trafficking, and criminal dynamics between Colombia and the hemisphere’s largest guerrilla group. Kjelstad studied away twice as an undergrad and moved abroad immediately after graduation. “I find the inner workings of organized crime fascinating, and was initially turned on to the subject after taking [sociology and anthropology] professor Suzanne Wilson’s Drugs and Society course my senior year. I am specifically interested in how organized crime in Latin America can co-opt politics at the local, state and, in some cases, national level,” Kjelstad said. He also credits professor Angelique Dwyer for her mentorship and support. “Dr. Dwyer was not only crucial in my development as a Spanish student, but also in inspiring me to live a life of service after Gustavus,” the Andover, Minn., native said. The professor has equally positive things to say about Kjelstad. “If I have been fundamental in [Kjelstad’s] development as a student, I can truthfully say that he has been impactful to my own growth as an engaged scholar as well,” Dwyer said, pointing out that Kjelstad was especially helpful with growing and sustaining the College’s Language Buddies program, which connects Hispanic families to Spanish-speaking Gustavus students in order to foster stronger language skills. “In Language Buddies we stress the importance of reciprocity. In this sense, Bjorn has motivated and challenged me as much as I believe I may have inspired him,” Dwyer said. Just as important as his time on campus was the time Kjelstad spent out of the country. 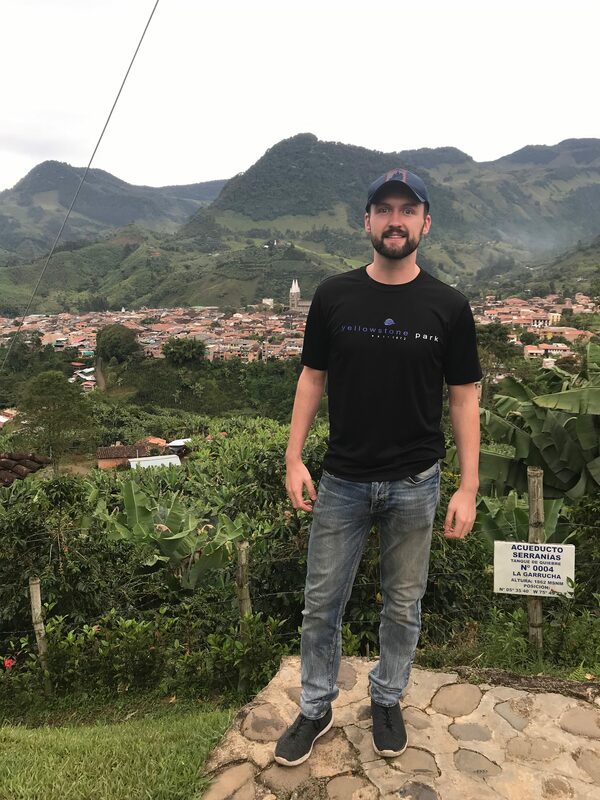 He studied away twice while a student at Gustavus: first to Havana, Cuba, during January Interim Experience, and later to Guanajuato, Mexico for the fall semester of his senior year. Kjelstad considers his work exploring crime in Latin America as not just interesting, but important. “It was very meaningful to analyze and participate in the debate over one of the most serious security threats facing Latin America today: organized crime. I was also extremely fortunate to be able to work with some of the most experienced, cited, and respected experts on Latin American organized crime in the world,” Kjelstad said. The biggest preparation for his career in Latin America, though, was larger than an individual department or experience. It was the liberal arts education he received at Gustavus. Considering a transfer after spending her first year of college at the University of Minnesota-Duluth, Nicole Lunberg’s first visit to Gustavus Adolphus College left her feeling at home. While the Saint Francis, Minn. native was wandering around the Jackson Campus Center, someone asked her a simple question: “How are you?” The seemingly inconsequential greeting sparked a sense of belonging and made her feel valued. Three years later, after being grounded in the College’s supportive community, recent grad is continuing to grow her skills as a project manager at consulting company Boom Lab. During her first semester at Gustavus, that “at home” feeling she had when visiting continued for Lunberg in the classroom. After taking a Public Discourse class in the Department of Communication Studies, Lunberg felt inspired to continue in the field with the support of professor Martin Lang. Lunberg threw herself into campus life, keeping busy through her involvement in the Mentorship Program, Gustavus Women in Leadership, three different internships, and working in the Center for Career Development. “When I worked in Career Development, I loved seeing how my passion and knowledge could help people feel less scared for the future,” she said. With on-campus internships with Gustavus marketing and communication office, human resources department, and admission office, and an internship in human resources at Ecumen, an assisted living facility, Lunberg truly embraced her “try anything” mentality. 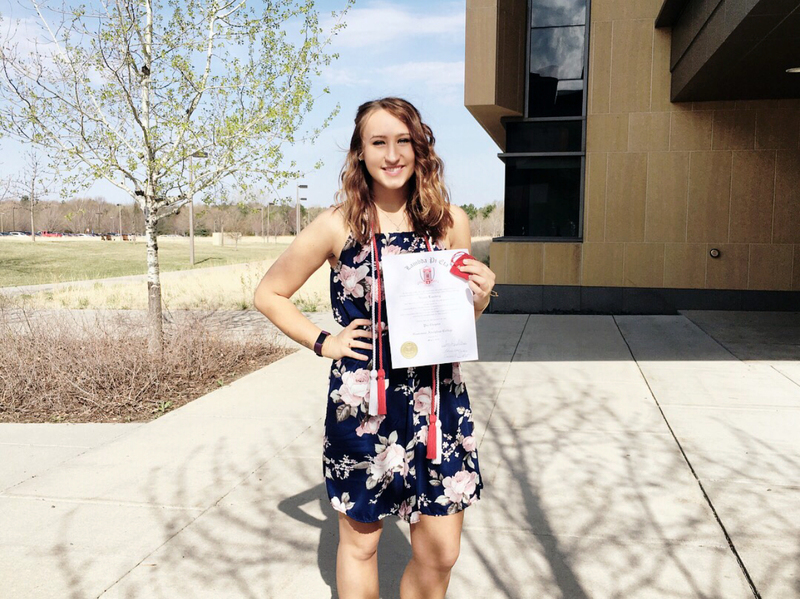 Lunberg was inducted into the Lambda Pi Eta National Communication Studies Honor Society. “Don’t do all of these great things because you’re expected to, do them because you want to and because it feels right in your heart,” she said. Testing out different fields helped her to gain relevant experience while sorting out what she liked about each position, leading her towards a future career in project management. “Nicole was ebullient as a student; she had lots of positive energy all the time. At the start, I think that she underestimated herself and has come to have a much deeper appreciation for herself,” Lang explained. After graduation, Lunberg landed a position with Boom Lab, a consulting company dedicated to hiring talented recent college graduates. She works alongside several other Gustavus alumni, which brings a sense of home into the workplace. Project management brings her joy due to its variety and the exposure to a range of companies. She is currently placed at a pharmaceutical company while it works to integrate its processes with a new health insurance provider. Creating status reports, measuring risks, and communicating with stakeholders to aid in the process fill out her main duties, and she will move to a different project with a new company in about a year. Looking ahead, Lunberg is excited to continue her career at a company that places value on her character and her ability to adapt. She is excited for the opportunities ahead, and finds inspiration in always moving forward.